The Nipros ES-series multi-core camera conversion system provides a cost effective fully featured HD/SD SDI studio camera conversion solution for the Panasonic handheld or shoulder mount P2HD camera-recorders The Nipros system will be available in two convenient packages. The 300-B package consists of the HDS-300 build-up unit, DC-P155 and DC-175 (AVCCAM / P2) camera power adaptor cables, DC-C40M05, VC-450, RCC-450P control cables, AS-1, ASC-AS1P Zoom control and cable, FR-P1, ACS-FR1P Focus control and cable. The 300-EM package consists of the 300-B package plus multi-core conversion system camera adaptor ES-500P and base station ES-600P. The 300-B basic package provides a simple studio style camera system with lens remote control where the complexity of a multi-camera system is not required. The camera operator can control the Zoom and Focus of the lens via controls on the handles of the tripod. If remote paint and iris control is necessary the EC4 can be connected directly to the Panasonic camera*1 and controlled up to 50 meters from the camera. The 300-EM includes the multi-core conversion system (ES-500P/ES-600P) for full remote control. Both the 300-B and 300-EM packages work with the Nipros HDF-700SK 7 type monitor. Panasonic camera recorder*1 and extension control EC4, not included in the price of the Nipros packages. The ES-series camera conversion system can transfer two lines of HD or SD SDI signal through a specially developed multi-core cable which interweave two HD/SD SDI cables with 26pin multi-core cable, this means both camera and return signal can be HD/SD SDI. Not only HD/SD SDI signals but also video component signals, HD-Y return, camera remote control, tally, time code, power supply, etc. can be transferred down one single cable. It realizes high quality and cost effective field and studio production system and maximum extendable distance between camera adaptor and base station is 50 meters with a max DC power is 50W. 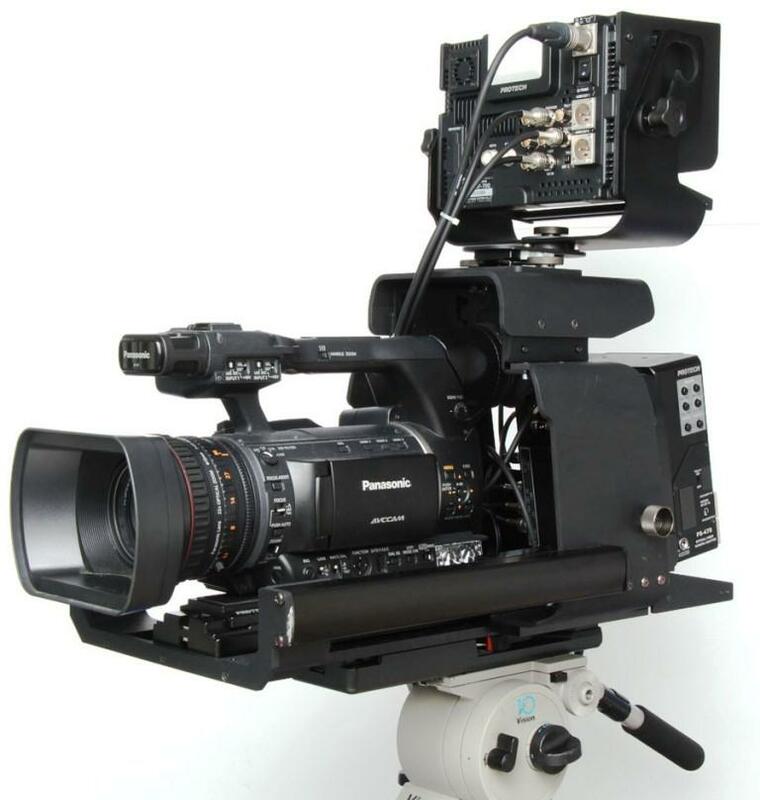 The ES-series consist of three main elements, the ES-500P camera adaptor, ES-600P base station and new developed specially for Panasonic HDS-300 studio build-up unit. The HDS-300 professional studio build-up unit was designed for either compact handheld or shoulder type camera recorders. 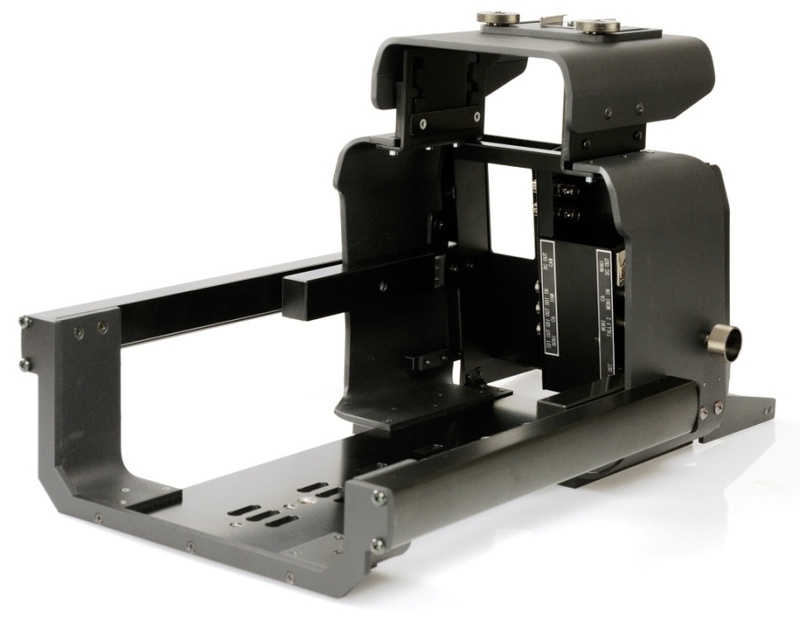 This robust and sample frame with aluminium die-cast chassis, the HDS-300 provides protection and easy connection to the ES-500P camera adaptor with a sliding mechanism. The HDS-300 can be mounted on a standard tripod adaptor plate such as the Panasonic SHAN-TM700. Size (WxDxH mm); 510x285x300, Weight; approx. 6.1kgs. The ES-500P originally designed for shoulder mount cameras can now be used easily with the Panasonic HPX255 when mounted in the HDS-300. The ES-500P camera adaptor provides all the required signals and functions you would expect on a professional studio/OB system. These include; HD/SD-SDI video signals for both camera and return video, Camera Remote control, Tally and TC outputs, audio input and output, audio level meter, XLR 4pin intercom headset jack, Video (composite or HD-Y) input, V-mount power supply with DC12V output (Max 4.5A). The ES-600P base station unit is a small ½ rack unit but has all the connectivity you would expect on a professional base station these include; HD/SD-SDI input with 2 x loop outputs, HD/SD-SDI return input with 2 x loop outputs HD/SD component output, Video output, AUX output (Video or TC out), REF input, TC output, intercom connections, 10 pin Panasonic camera remote control, audio input and output (3 pin XLR). The ES-600P base station also features a built-in cable loss compensation equalizer circuit for both of HD/SD SDI camera and return signals to optimise video quality over long distances. Either the Panasonic AG-EC4 or AJ-RC10 remote control units can be connected and operated with Base Station ES-600P for camera signal adjustment such as iris, gain, white balance, black level, gamma, detail, etc.